I'm installing an amp in my trunk, and I have all the wire routing figured out except for getting the power cable through the firewall to the battery. The only opening I found is right by the steering column where the (Cruise control?) vacuum hose goes through. Even though my cruise control doesn't work, I'd rather not interfere with any of the vacuum hoses (You guys know all about the 307 and it's vacuum-powered craziness). Plus, I'd like to fix the cruise someday. Anyone know of a better place to run a wire through? Re: Wiring for amplifier, anyone know a good firewall opening? Mine goes through where a little rubber boot was...I'll go outside after work and try to get a picture for you! Just run it with the cruise control. You can take the rubber grommet out around the hole or just push it through. 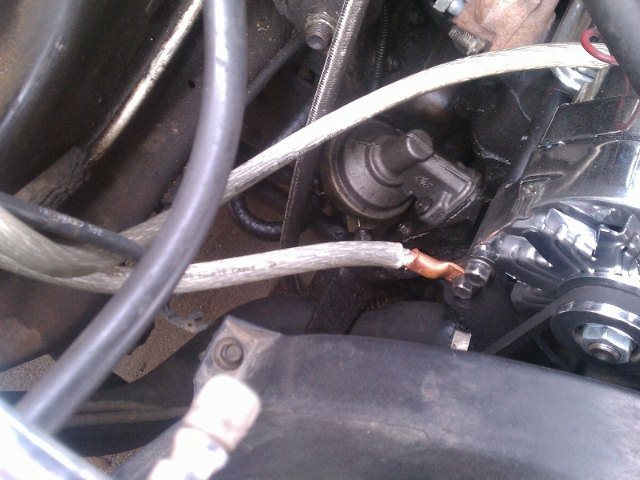 On my 85 Fleetwood the shop drilled a hole for the power cabel. On my 90 Brougham, I routed the wire through a rubber gromet, but this car has the 5.7 so the battery is on the passenger side of the car. I'm going to be taking it all out again and running 0 gauge instead, don't want to set my car on fire! the big 3 are the power wire from the alt to the batt, the ground from the engine to the bat, and the ground from the bat to the chassis. here are some pics from my chevy but its the same either way. hope this helps. Does the one from the battery to the chassis have to be that big? Mine is small like speaker wire. Its the stock ground wire that has the small chassis ground wire coming off of it. It melted and broke from the chassis. i think I ran 4 gauge when I did mine and my car hasn't ever got on fire. you have to match the ground from the amp with the one from chassis. so if you are using 0 gauge for the amp you want 0 gauge to the chassis. otherwise even if you use 0 gauge for the amp and keep the stock chassis ground, your chassis ground doesnt support the 0 gauge. so your amp will be asking for a higher amperage ground and your little stock wire cannot support it, hence the need to match them both. Are you talking about the amp ground wire or the ground wire from the battery? It would seem that the battery has about 4 gauge on the power and ground. im talking about matching the amp ground wire and the ground going from the battery to the chassis of the car. since you ground your amp to the body of the car you want to have the same amount of "flow". so for example lets say your amp requires at least a 4 awg power and ground to operate. you would want your ground to the chassis to be the same gauge or bigger than the one thats going to your amp. same for your power wire. 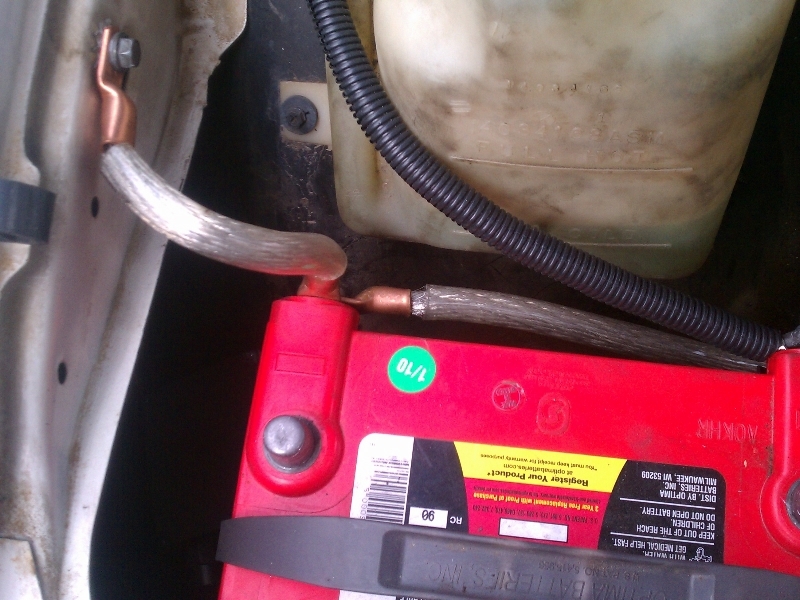 but the power wire can differ based upon how much wire you use to go from your engine bay to the trunk. but thats a whole other story simply your stock wires arent made to handle the amount of current that your subs and amp need. so to keep everything flowing nice and smooth you install bigger wires so now your car can handle the extra flow! now to determine how much and what size you should run for your power cable from the batter to the trunk you need to measure. its all about wire amperage etc. just go to the12volt.com and you can find out alot about wiring your car, amps, subs etc. 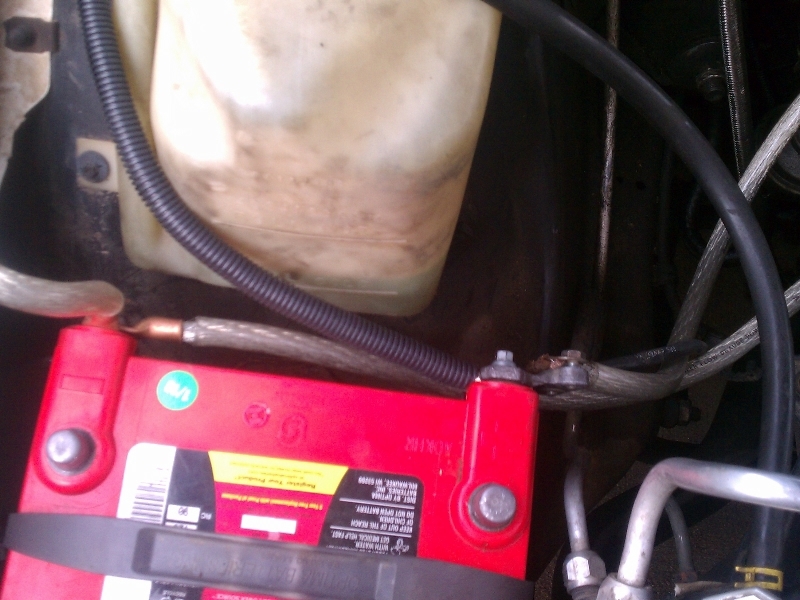 also as a side note the 4 awg cable going to the positive of the battery is usually going to the starter!!! so you can go bigger with that, i didnt i just changed the small ones going from the alt, to the battery and then i did the ground since the 4 awg for that is just ground on the engine somewhere(usually in the front) and then the little one that goes to the chassis from the battery. Picked up some 0-gauge wire today, was unsuccessful at installing it. Much to my own surprise, I managed to get it through the firewall, but that's about it. It's way too big and stiff to follow the same path I had the 8-gauge wire running . I think if I take a few more things apart I can get it in. Since my amp only accepts 4-gauge at it's power terminals, I'll have to get a power block and a short piece of 4-gauge for the power and ground, right? I've heard it's better to run the audio cables on the opposite side of the car, so I'll be doing that as well. I've also heard of some people running their power cables underneath the car. Is this an option I should consider? Wouldn't you have to make a nasty hole in the trunk to get the wire back in?